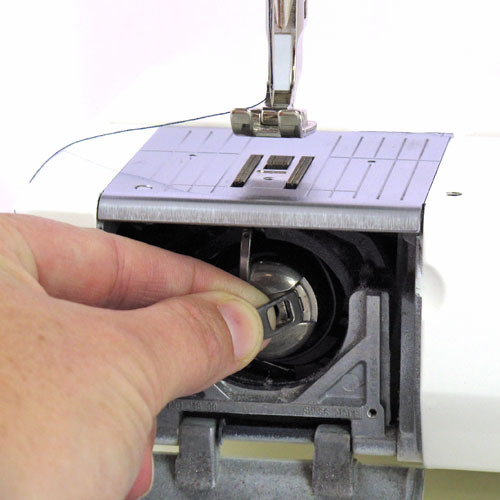 Tour of Your Sewing Machine - What's That Part Called? 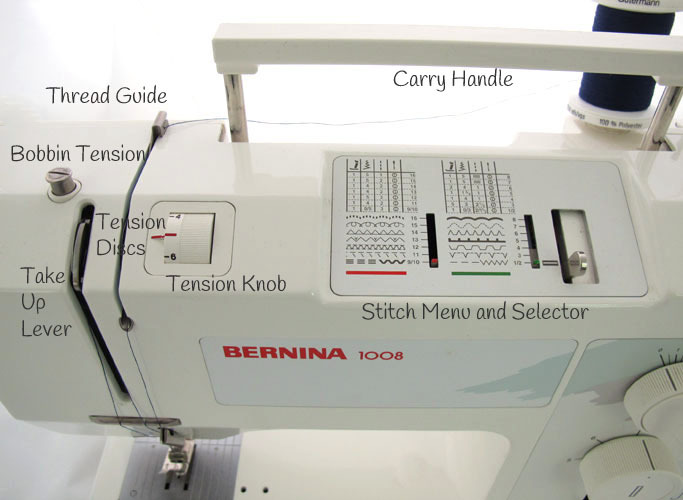 Here’s a quick tour of my Bernina 1008 which will hopefully give you a rough idea of where similar things are on your machine. This is one solid machine. It’s made of cast iron parts so it’s as heavy as lead. It’s also not fancy. There’s not a computer anything about it. My parents gave this machine to me for my 21st. I service it annually (unless I bugger the timing up in the meantime) and it’s been a faithful workhorse for years. I’ve see the same machines used for Home Ec classes in schools. 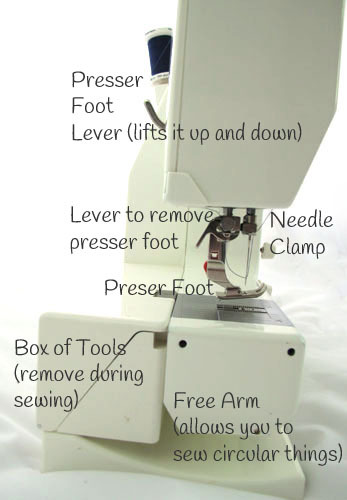 I do have an overlocker but I very rarely use it (mainly sewing garments). 90% of my sewing is on this machine. The top of my machine has the usual spool holders (see the Singer below for an example of a horizontal spool holder), tension adjustment knob and bobbin winding components. It also has a carry handle that lifts up and slides down into the body of the machine when not in use. 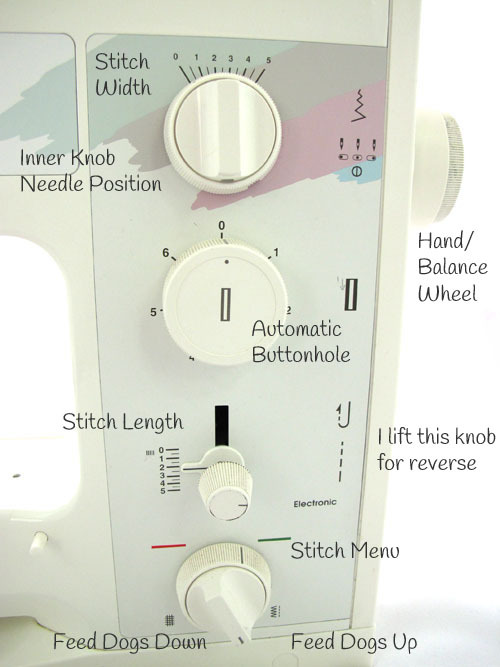 The Stitch Panel has four main knobs. The first one adjusts my stitch width in millimetres (0 is straight stitch, 5 is a wide zigzag). the knob in the middle of this one allows me to change my needle position from far right to far left. The needle will only move to the widest point of the zigzag (so I can move 2.5mm from the centre). I mainly move the needle across when using a zipper foot. Some machines won’t have this function at all. 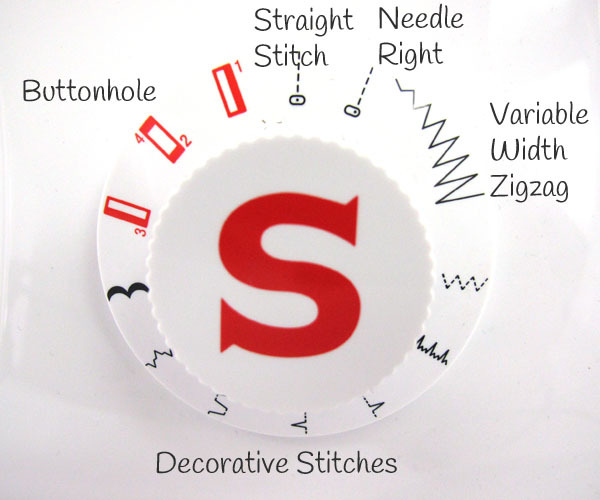 Others may have this function as part of a stitch selection knob. The Stitch Length also goes from 0 to 5 but this time it is stitches per mm. The best length for everyday sewing is 2.5. I wind it clockwise to get a longer stitch and anti-clockwise for shorter. I use a length of 2 for patchwork, 3 for topstitching on heavy fabrics and 5 for a basting stitch (used to hold seams when pins will get in the way also for gathering fabric – we’ll cover these in later Resources). I lift the Stitch Length lever for reverse when I need to backstitch. It springs back to the set length when I let go. The last knob allows me to select other decorative stitches (see the panel in the Top View). I have a Red menu and Green. The machine has suggested length, width and needle position settings which is handy and saves pulling out my manual. The outer ring allows me to drop down the feed dogs (the little jagged teeth that help to feed the fabric through under the presser foot). You would only really drop them down if you’re feeling adventurous to try free motion quilting or maybe writing with your sewing machine. This machine has a front loading bobbin to hold the bobbin vertically. 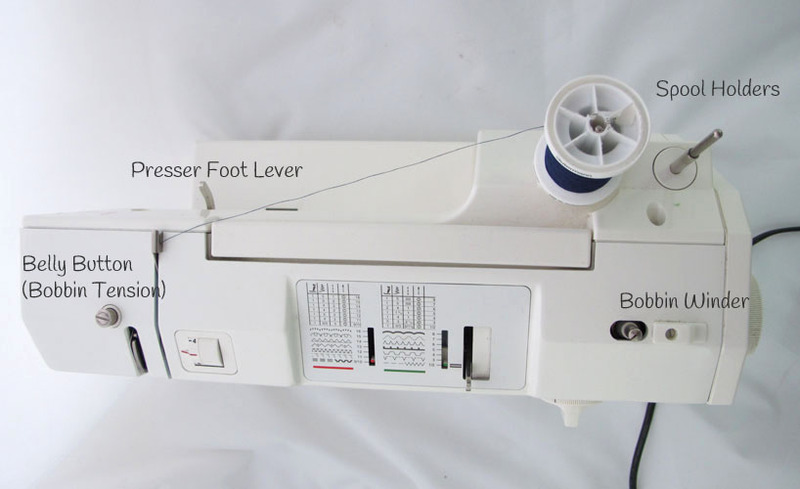 Some machines have a drop in bobbin which means the bobbin is horizontal (see Threading Your Bobbin for more information and useful links). A front loading bobbin means I have a door that drops down to access my bobbin case which fits around a central pin. You can just see the hook inside which will drop out when you push that Hook Release button. Useful to know if you ever get pieces of tangled thread stuck in there. The bobbin case will release from the central pin when you pull the lever as shown. 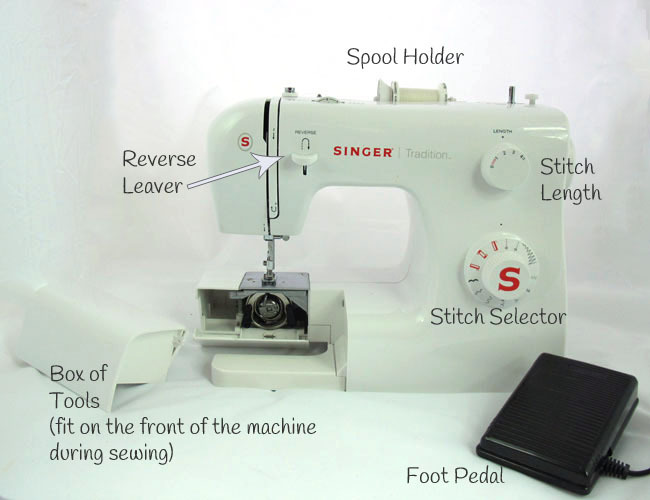 This is a great little animation to show you how a sewing machine actually works. This end is where I plug in the machine’s electrical cords. One cord goes down to a foot pedal on the floor and the other to the electrical outlet on the wall behind the machine. There is also the On/Off switch (I have two settings one is on without light, one is on with light). 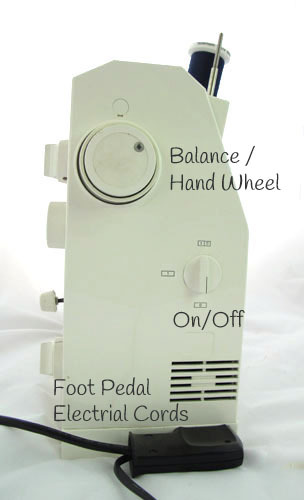 The Balance Wheel or Hand Wheel is how you ‘hand sew’ with your machine. I use it regularly. For example to return the needle to the topmost position when I finish sewing or to make tiny adjustments and single stitches on small appliqué shapes. This is the business end of your sewing machine. You’ve got the needle and presser foot (both removable and replaceable) but also the box of tricks that comes with your machine. This box slides off when you sew and has got all sort of bits and pieces inside. There are extra presser feet (your zipper foot for example), a buttonhole foot if you don’t have a knob and things for maintaining your machine in tip top condition (screwdriver, oil etc). 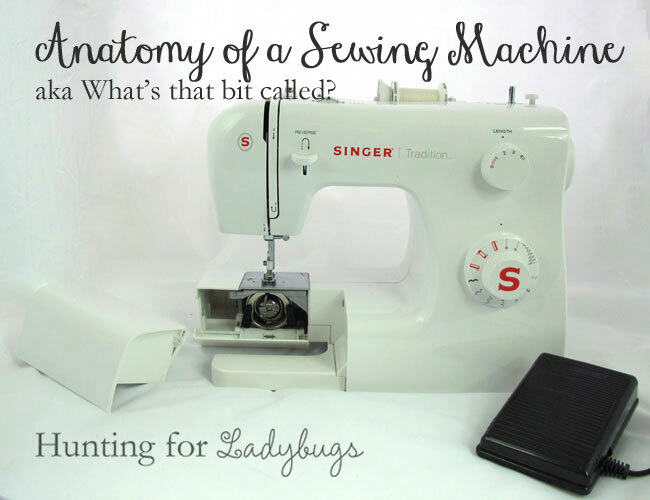 I’ll be writing another resource post on How to Maintain Your Sewing Machine soon. This is the other example of a machine I could access to photograph. As you can see, mostly the main things but slightly different positions. The spool holder is horizontal. The Stitch Selector gives me much less control over individual length and width settings and the Reverse leaver is in a different position entirely. This one you push down to reverse and release to move forwards again. 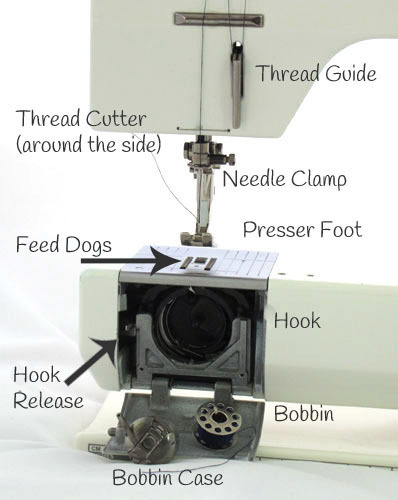 You also need to keep the ‘Box of Tricks’ on the machine free arm while sewing. 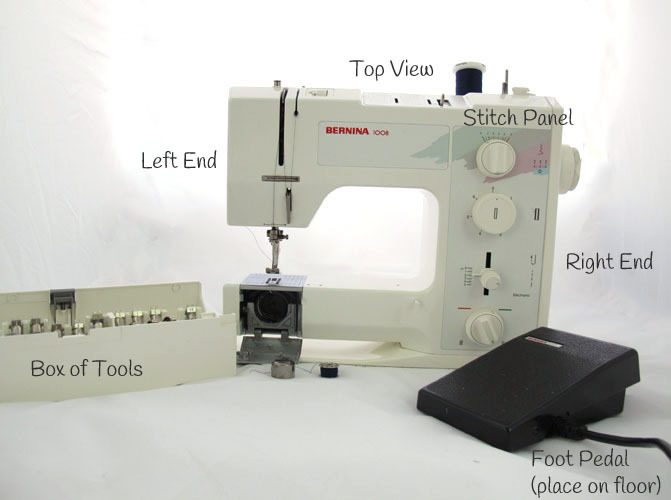 I hope this proves useful as you begin to navigate your way around your sewing machine. Please get in touch if you’ve got any feedback to improve this resource for others.